– but cannot find any available tickets? when tickets are sold out everywhere else! Alcatraz Cruises is the official concessionaire of the National Park Service providing ferry service to and from Alcatraz Island. When Alcatraz Cruises sells out of tickets, select third-party tour companies are authorized to re-sell tickets. DiscoverTown Tours is one such third party Authorized Reseller. DiscoverTown Tours is an Official Tour and Travel Partner of Alcatraz Cruises. As such it has been granted the right to use the Alcatraz Cruises logo in its Alcatraz resale promotions. Are the Alcatraz Tickets resold by DiscoverTown Tours the official tour? What is the Alcatraz Ticket availability from DiscoverTown Tours? Why are Alcatraz Tickets sold as part of a combination tour? Can I purchase Alcatraz Tickets at any time from you? Will I get to go inside Alcatraz? Or is it just a boat ride around the island? Do you have Alcatraz Night Tours? Do you provide transportation to the Alcatraz Tour Landing, Pier 33? The Alcatraz tour departure times you list are not convenient for my group. Do you have other departure times available? Or can I use my ticket for another time? For all Alcatraz packages, can other tours be done Before or After Alcatraz? Are reservations needed for Big Bus Hop-on-Hop-Off or Bay Cruise components? What about reservations for Muir Woods, Wine Country, or the Sunset Cruise? Do you offer the Alcatraz Behind the Scenes Tour? If Alcatraz Cruises and DiscoverTown Tours are both sold out, do you have referrals? Alcatraz Cruises' website says they are the "the Official Provider of Alcatraz Island Tour Tickets." How are you a provider? How are you a source for tickets? What is the Same Day Ticket Advisory? Can I get same day or next day Alcatraz tickets from a reseller? What about StubHub or Craigslist and such? Is Alcatraz Wheelchair Accessible? How steep is the hill? What if I have mobility issues? As an authorized re-seller we obtain a limited number of tickets, in advance, available for Alcatraz Day and Night Tours. All Alcatraz tour tickets sold by DiscoverTown Tours are guaranteed. Once you make your purchase, the Alcatraz portion of your tour is guaranteed and locked in... Your Alcatraz tickets are taken from our pre-paid, limited allocation at the time of purchase. Many of our guests have reported frustrations with other companies that make you wait 48 hours only to be told Alcatraz tickets are not available. Again, we either have the Alcatraz tickets, or we don't. Are the Alcatraz Tickets resold by Discover Town Tours the official tours? Yes. Alcatraz - as a portion of the tour packages we sell - is the only round trip ferry from the Official Concessionaire to the National Park Service, Alcatraz Cruises. This is true for Alcatraz Day Tours or Alcatraz Night Tours. What is the Alcatraz Ticket availability from Discover Town Tours? Peak periods for Alcatraz Tours run from May to September… plus both Thanksgiving and Christmas holiday times. Alcatraz Tickets sell out weeks in advance during peak seasons. January and February are the slower months. We buy tickets in advance from Alcatraz Tours for re-sell, and we are granted a limited number of tickets at the time of purchase. These change with the seasonal availability. Tickets from Discover Town Tours must be purchased 4-days in advance of the Alcatraz Tour for us to guarantee your Alcatraz Tour. Alcatraz tickets sell out fast. Often weeks in advance. If you missed the opportunity to buy directly from Alcatraz Cruises, tour companies selling tour packages is a viable option. We operate under the rules of the National Park Service and Alcatraz Cruises, particularly the requirement to only resell Alcatraz as part of a combination tour package. Combination tour packages are a great way to see more of the San-Francisco Bay Area and some of the wonderful sights it has to offer. However, if some guests choose to only go to Alcatraz, as you are not forced to attend the additional tours included in the combination package. Then choose a tour package. Pick an Alcatraz departure from within that package page. Enter the number of tickets and choose an Alcatraz date and time from the drop-down menu. If you see a “Book Now” message, that means Alcatraz tickets are available for that date/time/quantity. Upon purchase, your screen will show a five-digit invoice number confirming receipt. Again, once you make your purchase, the Alcatraz portion of your tour is locked .. Your Alcatraz tickets are taken from our pre-paid, limited allocation at the time of purchase. Once your full tour package is confirmed, there are no refunds or exchanges. At the time of purchase, you will check a box agreeing to these and other terms and conditions. After your order is placed, your ticket count and the names of your group members will be given to Alcatraz Cruises. Your Alcatraz tickets will be waiting for you on the day of departure. They will have been set aside from our pre-paid allotment and go only to you. Upon purchase for all products, you can save or print your Voucher. We will also send you a duplicate email-based Voucher. The Voucher confirms all reservations and includes instructions for taking a tour(s). We recommend that you download the Voucher. Regardless, you should receive a duplicate email with the word "Voucher" in the subject line. This should come within 2 hours after seeing your purchase confirmation (showing a 5-digit order number). If you do not obtain a Voucher, please check your junk mailbox... Then if another copy is needed, please email us at discovertowntours@gmail.com, and we'll get one out asap. Note that there is no bar code or pdf attachment, so do not search for one. Although this website is open for business 24/7, we have a set number of tickets, so we advise that you make your purchase quickly to guarantee that we will have tickets for your desired date and time. Our monthly allotment of Alcatraz is limited (Day and Night combined), so we may sell out of our small stock, especially during peak periods. And within four days before departure, we can't help. We resell the tickets that take you onto Alcatraz Island and put you inside the prison, always with the Cell House Audio Tour in 11 languages (Dutch, English, French, German, Italian, Japanese, Korean, Mandarin, Portuguese, Russian and Spanish). To be clear, some of our packages include a second boat ride (Bay Cruise or Sunset Cruise), but the round trip to Alcatraz Island is the core of all of our combination packages. For more details on the Cell House audio and the island experience, click on the Alcatraz description tab once you are viewing any Tour Package page on this site. This is a great tour in high demand. It takes roughly 3 hours and is far less crowded than the day tour. Review the Alcatraz Night Tour description tab on any Alcatraz Night Tour Package here on DiscoverTown.com. This tour sells out well in advance of the day tour. We offer Alcatraz Night Tour Packages, particularly in winter, spring, and fall. We have them less often in summer and for Christmas week. Few resellers offer this. You have come to the right place. If our Alcatraz Night Tour options are sold out, try an Alcatraz Day Tour Package. During peak periods we may not offer the Night Tour at all. We are not always able to obtain them for resale. Alcatraz Day Tours usually take 2-2.5-3 hours total time. The Audio presentation inside the prison runs about 50 minutes. Boats leave the island every 30 minutes; you decide when to leave. Night Tours are on a set return schedule and the total time is just about 3 hours. During the day, there may be a queue to get on a return boat. You may not be able to get on a boat right away if enough people are in line before you, you may wait another 30 minutes for the next boat. No. You must get yourself to Pier 33 at least 30 minutes before the ferry departure time. Alcatraz Tour departures are time-specific and date-specific. The schedule departures we offer cannot be changed. Occasionally we may have referrals that might offer a different time. YOU CHOOSE the days for each tour. For Alcatraz Packages that include Muir Woods, Wine Country, or the Sunset Cruise, you must select dates/times for these tours at the time you purchase the package. Bay Cruises and Big Bus Tours do not require any date selection. But you may want to plan ahead as to which day you intend to activate those tickets and take those tours. Bay Cruises and Big Bus Tours can be done the same day as Alcatraz - IF TIMED PROPERLY. The Chinatown walking tour can be done on any day without reservation requirements. Instructions are included on your Voucher. If flexibility is important to you, these tours may offer your best option. If you start the Big Bus hop-on-hop-off tour late in the day, your available hop-off time will be limited. If you take the Big Bus hop-on-hop-off before the Alcatraz Night tour, it will be critical that you keep an eye on the clock and finish the tour at Fisherman's Wharf well in time to transition to the Alcatraz Night Tour. NO RESERVATIONS ARE NEEDED for these tours. This may be in the afternoon once you have completed Alcatraz… or possibly in the morning before the Night Tour (if you give yourself sufficient leeway)... or any time/day after Alcatraz. We recommend the hop-on-hop-off tour for another day, when you have no major commitments in the evening. You must get yourself to Fisherman's Wharf (Pier 43&1/2) for the Bay Cruise or get yourself to Union Square (Geary & Powell Streets) or Fisherman's Wharf (99 Jefferson Street) for the Hop-On-Hop-Off. For these tours, within 24-48 hours you should receive final confirmation as we secure final reservations with our tour partners. Once confirmed, tours cannot be changed. All confirmed reservations are final sales. If you have not received a final confirmation for this part of the tour package within 24-48 hours, please email or call us. For Muir Woods or Wine Country, courtesy shuttle pickups are only available at select hotels, primarily Downtown SF and Lombard Street. Fisherman's Wharf hotels are walking distance to Tower Tours' office or the Red & White Fleet Sunset Cruise, so no hotel pickups there. If pickups for Muir Woods or Wine Country are not available at your hotel, we will notify you. There are no hotel pickups for the Sunset Cruise. Note that a Muir Woods 9:00 am tour can be done the same day as an Alcatraz Night Tour. The 2:00 pm Muir Woods tour cannot. We do not sell the Alcatraz Behind The Scenes Tour. We know of no reseller that does. To our knowledge, these are sold only through AlcatrazCruises.com, and they sell out many, many weeks in advance. Yes, sometimes we can make referrals. Including for the Night Tour. If the Alcatraz date you seek is unavailable, but more than four days away, check out our Referral page. If we have referral dates that can help you, then Contact us for possible referral. IF YOU ARE SEEKING TICKETS WITHIN 4 DAYS OF DEPARTURE, CALLING OR EMAILING US WON'T HELP. For such last-minute tickets, see the "Same Day Ticket Advisory" information above. This language is a little confusing. Alcatraz Cruises is indeed the only provider of ferry service to Alcatraz Island. 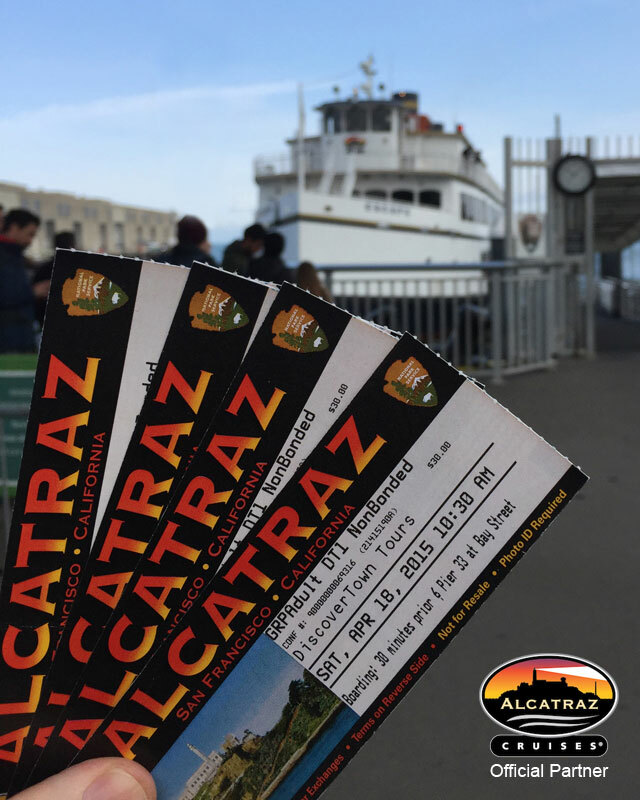 So you need an Alcatraz Cruises ticket. They are the Official Concessionaire to the National Park Service. We are an Authorized Reseller of Alcatraz Cruises, guided by their policies for Tour & Travel Operators. They also say "Don't be fooled by unauthorized sellers..." but they don't immediately explain that they give select companies authorization for resale. If you go to Alcatraz Cruises' FAQ page and find “FAQ's About 3rd Party Ticket Sales” you will see that they do authorize resale under restricted conditions, including tour packages. We follow these regulations. At Pier 33, Alcatraz Landing, at 7:30 am when Alcatraz Cruises opens their window, each morning roughly 50 - 100 tickets are sold at face value directly to the public. The volume varies by season. Generally, more tickets are available in summer since SF tourism is at its highest. Alcatraz Cruises will not say what is available in advance of any given day. A maximum of four tickets will be released to any group with at least one adult over age 18. All four travelers must be in line. Unfortunately, one martyr on the cold dock cannot hold a place for three Everybody must suffer together. One ticket per person in line. Security guards keep this in check. All adults (age 18+) must have a government-issued photo ID ready to present (if you can get tickets). Tickets given are usually for one of the first three Possibly later. This also may vary. Similarly, a very, very limited number of Night Tour Standby Tickets can be obtained by waiting in this same line. Getting on the Night Tour this way is a complete gamble of your time - in the morning and then again that same evening. As few as 10 standby tickets may be handed out and there is no way to know how many regular ticket holders may miss the boat to free up space for you. Before you disrupt your vacation waiting on the frigid dock, we suggest that you go to Pier 33 and find out all of this for yourself. You cannot get same day or next day Alcatraz tickets from discovertown.com or any Authorized Reseller. Resellers must submit the names of all of their guests four days before departure. Therefore we do not have tickets for the very last minute. If you want Alcatraz tickets within four days, you can compete with others for a very limited number of same-day tickets – known as the "Same Day Ticket Advisory." Alcatraz Cruises requires all purchasers over age 18 need to show a photo ID that matches the name on the ticket. Alcatraz Cruises states that "visitors are required to show proof that they are the actual purchaser of a ticket, and if unable to confirm this ‘proof of purchase’ they may not be allowed on the boat." Previously reseller tickets just listed the name of the reselling company. Now all tickets include the name of the individual guest. If you purchase a ticket with the name of someone else on it, your photo ID won't match the ticket. The ¼-mile walking road on Alcatraz is steep, equivalent to a 13-story rise over that distance. But the SUSTAINABLE EASY ACCESS TRANSPORTATION (S.E.A.T.) tram is there for guests with mobility issues. This tram is available roughly twice per hour. It runs from runs from the Alcatraz Island dock to the Cellhouse ... and back down to the dock. It has retractable ramps that allow for both manual and power wheelchairs. Once at the prison, inside the Cellhouse there is an elevator. Boarding S.E.A.T. is on a first come, first served basis. Guests with mobility issues using this tram may be accompanied by one other person in their group, space permitting. Groups can meet up at the Cellhouse or the Alcatraz Island dock. S.E.A.T. is not for mobile children/strollers. FOR ALCATRAZ TOUR: Bring your email Voucher to Pier 33, Alcatraz Landing. You can show a printed copy of your Voucher or show it on your phone or tablet. All travelers over age 18 must show a government-issued photo ID. Plan to arrive at least 30 minutes before your departure, but not more than 2 hours early. You will not be able to get your tickets more than 2 hours before departure. Expect fog or cool weather at any time. Wind-proof jackets are highly recommended for Alcatraz, Bay Cruises, and the open-air hop-on/hop-off bus. Skull caps are a smart idea. No Refunds or Exchanges on Alcatraz Packages. No Refunds for Missed Tours. No Refunds for Tours Not Used. At check out, you must check a box that you agree to the Terms and Conditions. Cancellation options for non-Alcatraz tours are limited by time. See Terms and Conditions. com does not collect credit card data. All credit card information runs through Stripesecure payment systems. To return to our splash pages, click for Day Tours, Night Tours, or both Day & Night options.